Have I ever mentioned to you all that I love to read? 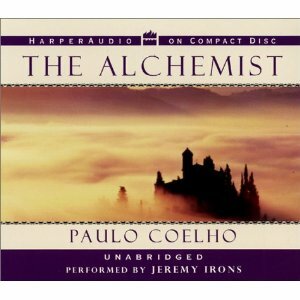 One of the best books I have read in recent memory is, "The Alchemist." This book reinforces the importance of pursuing your dreams, not letting the possibilities of failure stop you from proceeding, and not letting your own judgements and fears get in the way of making life the best it can be. I highly recommend reading this inspirational treasure, which is quite short and well-worth your time - I read it in one evening. If someone isn't what others want them to be, the others become angry. "What's the worlds greatest lie?" the boy asked, completely surprised. "It's this: that at a certain point in our lives, we lose control of what's happening to us, and our lives become controlled by fate." "Everyone, when they are young, knows what their Personal Legend is..." "At that point in their lives, everything is clear and everything is possible. They are not afraid to dream, and to yearn for everything they would like to see happen to them in their lives. But, as time passes, a mysterious force begins to convince them that it will be impossible." "Treasure is uncovered by the force of flowing water, and it is buried by the same currents." He learned the most important part of the language that all the world spoke—the language that everyone on earth was capable of understanding in their heart. It was love. It was the pure Language of the World. It required no explanation, just as the universe needs none as it travels through endless time. The future belongs to God, and it is only he who reveals it, under extraordinary circumstances. How do I guess at the future? Based on the omens of the present. The secret is here in the present. If you pay attention to the present, you can improve upon it. And, if you improve on the present, what comes later will also be better. Forget about the future, and live each day according to the teachings, confident that God loves his children. Each day, in itself, brings with it an eternity." "You must understand that love never keeps a man from pursuing his Personal Legend. If he abandons that pursuit, it's because it wasn't true love." "They were looking only for gold," his companion answered. "They were seeking the treasure of their destiny, without wanting actually to live out the destiny." "The wise men understood that this natural world is only an image and a copy of paradise. The existence of this world is simply a guarantee that there exists a world that is perfect. God created the world so that, through its visible objects, men could understand his spiritual teachings and the marvels of his wisdom." "Why do we have to listen to our hearts?" the boy asked, when they had made camp that day. "Because, wherever your heart is, that is where you'll find your treasure." "But my heart is agitated," the boy said. "It has its dreams, it gets emotional, and it's become passionate over a woman of the desert. It asks things of me, and it keeps me from sleeping many nights, when I'm thinking about her." "Well, that's good. Your heart is alive. Keep listening to what it has to say." "You will never be able to escape from your heart. So it's better to listen to what it has to say. That way, you'll never have to fear an unanticipated blow." "Tell your heart that the fear of suffering is worse than the suffering itself. And that no heart has ever suffered when it goes in search of its dreams, because every second of the search is a second's encounter with God and with eternity." "We, people's hearts, seldom say much about those treasures, because people no longer want to go in search of them. We speak of them only to children. Later, we simply let life proceed, in its own direction, toward its own fate. But, unfortunately, very few follow the path laid out for them—the path to their destinies, and to happiness. Most people see the world as a threatening place, and, because they do, the world turns out, indeed, to be a threatening place. "So, we, their hearts, speak more and more softly. We never stop speaking out, but we begin to hope that our words won't be heard: we don't want people to suffer because they don't follow their hearts." "Every search begins with beginner's luck. And every search ends with the victor's being severely tested." The boy watched the exchange with fascination. "You dominated those horsemen with the way you looked at them," he said. "Your eyes show the strength of your soul," answered the alchemist. There is only one thing that makes a dream impossible to achieve: the fear of failure." There's no need for iron to be the same as copper, or copper the same as gold. Each performs its own exact function as a unique being. Ahhh. I love The Alchemist. Also, my favorite talk in church was given about 6 months ago by a guy in the Stake Presidency that equated the gospel to alchemy and it ran really close to this book. It was just good. Is it an easy read? I'm considering getting it in the author's native language, Portuguese. But if it's difficult to read in English, it might not be worth it. Chels - I didn't feel like it was a difficult read at all. There is a lot of hidden meaning, but I read it in one evening. You may actually find much more in the original language. All Shook Up: Free Preview Performance Tonight! Can You Be in Love With More Than One Person?